After SpaceX and Orbital Sciences successfully docked at the International Space Station with space capsules built by privately funded teams only a fraction of the size of those of national agencies, and propelled into orbit by similarly built rockets, no one doubts anymore that a new era of space exploration has arrived – the era of a new space race. This time it’s not warring countries looking to prove their dominance, but private investors and entrepreneurs looking to make profit – various types of profit. At the International Space Commerce Summit taking place in London this week, many facets of commercial space have been discussed and at times, they seemed to be rather worlds apart. If you missed Day One, you can still make Day Two! Speakers include Bas Landorp (MarsOne), Andrew Nelson (XCOR), and Tommaso Sgobba (IAASS). 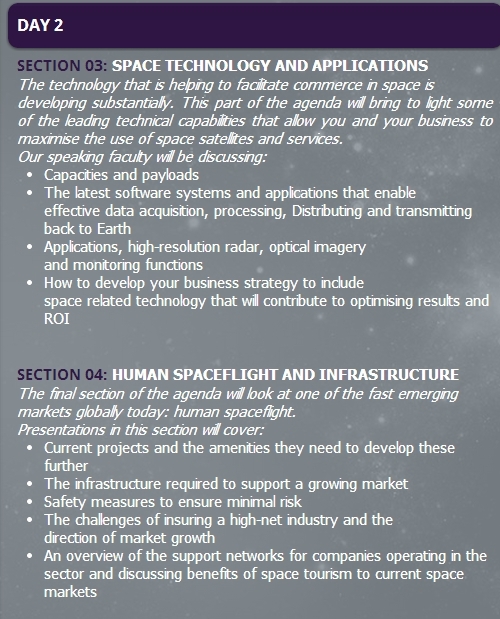 Learn more at www.spacecommercesummit.com. Opening the session was Texan entrepreneur, space activist, and founder of the Space Frontier Foundation, Rick Tumlinson. Recently listed by Space News as one of the 100 most influential people in the space industry, Tumlinson, with a baseball cap on his head, resembled a mixture between a persuasive American football coach and a slightly deluded religious cult leader. Talking about the bright future of a spacefaring mankind, which is about to open in front of us thanks to those like SpaceX, Orbital Sciences, and of course Tumlinson’s Deep Space Industries, he painted a picture of prosperity and renaissance of the human race once space is finally conquered and colonized, contrasted with a doomsday vision against this picture if we fail to seize the chance. However, those carried away by Tumlinson’s visions of mining asteroid resources for the all-encompassing welfare of the finally united and finally space-faring mankind were soon brought back to reality, as right after his impressive introduction, a series of considerably more modest presentations followed. Introducing rather humbler goals, like developing high tech industry in Eastern European countries, boosting job creation, and creating applications to help farmers increase their yields, the representatives of European space agencies and companies seemed to have their feet a bit more firmly on the ground. And why shouldn’t they? In fact, everyday space is also space, and is perhaps more important for the functioning of our world than billionaires venturing to space on suborbital planes or looking for how to make more money mining asteroids. Certainly the divide between the European and American concept of commercial space was present throughout the first day of the summit. Quite symbolically, the Europeans, still bound to the old continent which the ancestors of today’s Americans left centuries ago to seek a better future, seemed quite content to keep developing new ways to use satellite data and keep building better satellites to watch our Earth – believing that even without conquering outer space, there is an optimistic future bringing decent economic growth. How can we exploit space, part of humanity’s common heritage, when only a few will reap the benefits? And what would happen if everyone started launching small satellites into space? And of course – do private space operators think about insurance? How do you best approach an angel investor and what does a good business plan look like? Well, there are many facets of commercial space. Some of them might never make the headlines, but are they really less important?